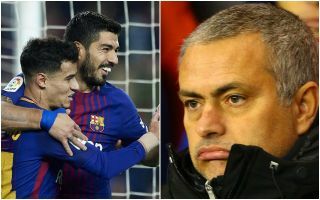 Luis Suarez has shown his Liverpool roots with a naughty dig at Manchester United manager Jose Mourinho after commenting on the Paul Pogba transfer saga. The Barcelona striker admits he would love to see Pogba make a move to the Nou Camp as he’s a big fan of the France international’s qualities. This follows speculation linking Pogba with Barca, with Suarez doing his bit to persuade the player it could be a good move for him, referencing the lack of major honours he’s been challenging for at Old Trafford. The 25-year-old joined United in 2016, with the club only finishing 6th in the Premier League that year and winning minor trophies like the Community Shield, the League Cup and the Europa League. Barcelona, meanwhile, are regular La Liga winners and usually strong contenders for the Champions League as well. “Pogba’s an elite player who’s won everything,” Suarez told RAC1, as per ESPN. “He has a lot of quality and he’s one of the references at United. This seems a clear dig at how United have stalled under Mourinho, who no longer looks capable of getting the best out of players like Pogba or of challenging for the kind of trophies he used to win on a regular basis.